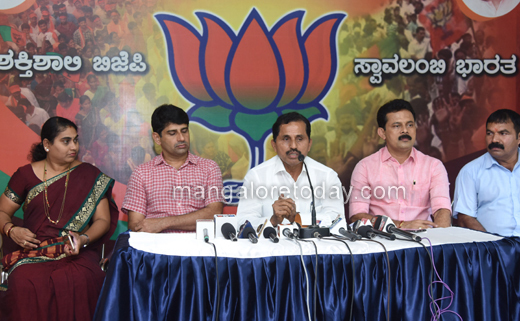 Mangaluru, July 04, 2018: BJP spokesperson Harikrishna Bantwal has accused former minister B Ramanatha Rai of making irresponsible statements regarding Dakshina Kannada MP Nalin Kumar Kateel. Addressing press persons here, Haririshna Bantwal demanded that Rai must apologise for describing Nalin Kumar Kateel as the laziest MP. He also mocked at Rai stating that the former minister who is now all alone belonged to the Kumbhakarna family. He was caught sleeping in several meetings and even in the assembly, said Harikrishna. The BJP spokesperson also mocked Rai’s statement that the Siddaramaiah rule was a golden era in the state, and alleged that it was era that was marred by communal violence, suicide of farmers and murders of Hindu activists. He further charged Rai of supporting the sand mafia. These people are fit for commenting on one another.